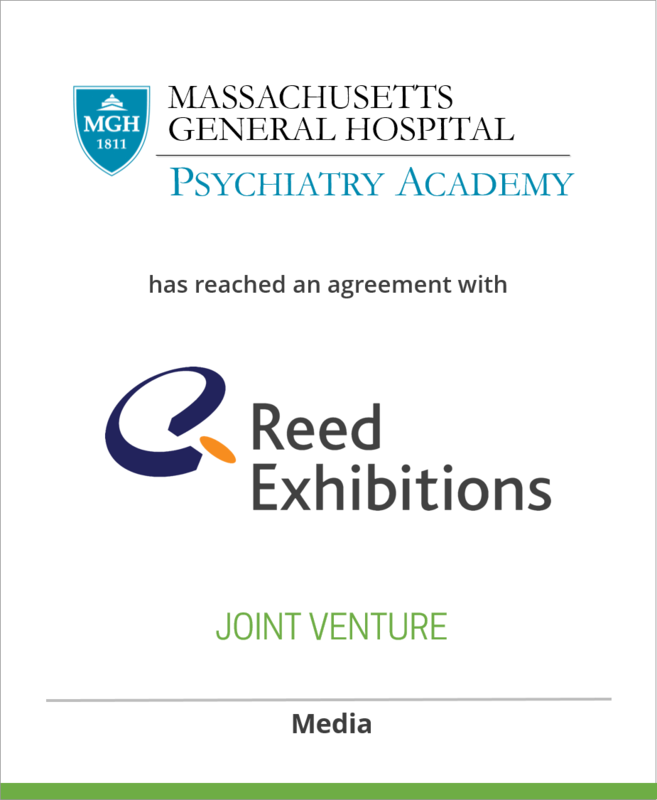 Massachusetts General Hospital Psychiatry Academy has concluded a 25-year Agreement with Reed Exhibitions to provide a suite of CME offerings. Under the agreement, Massachusetts General Hospital’s Psychiatry department will focus on analyzing education needs of psychiatrists in order to design quality content aimed at improving patient outcomes. Reed Medical Education will concentrate on audience development, marketing, and logistics. Jointly, the two entities will work on growing the program internationally, developing patient education programs and developing new education delivery methods for the psychiatric community. The Massachusetts General Hospital Department of Psychiatry has been ranked #1 by US News and World Report’s Survey of America’s best hospitals for the past 12 consecutive years. It is an institution with international recognition for innovation, pioneering scientific and clinical research and state-of-the-art, practice-based psychiatry. Massachusetts General Hospital, established in 1811, is the original and largest teaching hospital of Harvard Medical School. MGH conducts the largest, hospital-based research program in the U.S., with an annual research budget of nearly $500 million and major research centers in AIDS, cardiovascular research, cancer, computational and integrative biology, cutaneous biology, human genetics, medical imaging, neurodegenerative disorders, regenerative medicine, systems biology, transplantation biology and photomedicine. MGH and Brigham and Women’s Hospital are founding members of Partners Healthcare Healthcare System, a Boston-based integrated health care delivery system. Reed Medical Education, the healthcare unit of Reed Exhibitions, was organized in 2004. Working closely with sister company Elsevier, Reed organizes the Oncology Congress, Supportive Oncology, Community Oncology, Perspective in Women’s Health and Clinical Consensus on COPD. RME also manages New Perspectives in Oncology Practice an event for nurses during the Chemotherapy Foundation Symposia. The RME portfolio also includes Contemporary Forums, which offers some 35 events in 14 states serving 12,000 healthcare professionals for accredited continuing education conferences in areas such as pediatrics, neonatal care, psychiatry, women’s health, obesity, neurology and critical care.